John Ruskin (1819-1900) was an artist, scientist, poet, environmentalist, philosopher, and the preeminent art critic of his time. In terms of art, he provided the impetus that gained respectability for the Pre-Raphaelites. Ruskin was not an architect, but as writer (Seven Lamps of Architecture, 1849, and The Stones of Venice, 1851-53) he influenced the return from Neoclassicism to the earlier Gothic style. The Stones of Venice, contains the celebrated chapter on "The Nature of Gothic," which for the first time equated the beauties of medieval architecture and decoration with the pleasure taken by the workman in producing them. This influenced William Morris. English critic and social theorist John Ruskin (1819-1900) more than any other man shaped the esthetic values and tastes of Victorian England. His writings combine enormous sensitivity and human compassion with a burning zeal for moral value. Perhaps Ruskin's most enduring contribution to the development of modern style was his hostility to classicism. He himself was too devoted to ornament and too hostile both to the machine and to standardized construction ever to figure as a grandfather of functionalism. John Ruskin, the greatest Victorian bar Victoria, was an artist, scientist, poet, environmentalist, philosopher, and, importantly here, the pre-eminent art critic of his time. He provided the impetus that gained respectability for the Pre-Raphaelites. 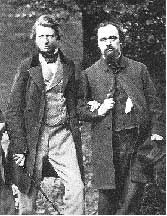 Ruskin's letter to The Times in 1851, supporting the much-derided Pre-Raphaelites for their naturalism and truth to nature, marked a turning point in their perception by the public. In a second letter, he wrote that the Pre-Raphaelites might "lay the foundation of a school of art nobler than the world has seen for 300 years." Ruskin taught Pre-Raphaelite style drawing at the Working Men's College in London for some years, enlisting Rossetti to teach figure and watercolor painting, and afterwards Ford Madox Brown to fill the same position. Ruskinian Gothic architecture is named for the great Victorian era figure John Ruskin, the first professor of Fine Arts at Oxford University in England, and the most influential art and architecture critic of the nineteenth century. In poor health as a child, Ruskin was taken frequently by his parents to Venice, where he was dazzled by water-reflected sunlight playing across the wonderfully multicolored marble facades of medieval Gothic buildings. In his second important book, The Stones of Venice, written in 1851, Ruskin advanced the idea that these Northern Italian Gothic buildings should be the perfect model for modern architecture in England and the English-speaking world, and his skilled illustrations for the book illustrated the wealth of Venetian color and carved stone ornament from which he hoped architects would derive inspiration. Perhaps the most important aspect of this architectural style and this building is the presence of what Ruskin called "constructional polychromy." This simply means the use of multi-colored building materials ... for the sake of the colors and the patterns which can be made from them. | ...Home Page ...| ..Buffalo Architecture Index...| ..Buffalo History Index....|.. E-Mail ...| .